Hand poured in small batches, with 100% soy derived from non-GMO Canadian-grown soybeans for an eco-friendly, clean burn. A lead-free cotton wicks, and pure essential oils, no added dyes or chemicals. 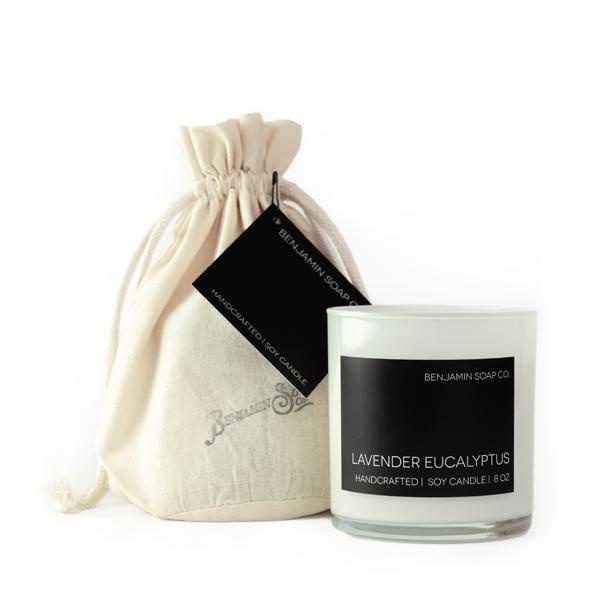 Each candle is packaged in an organic cotton reusable bag. Instructions: When first lighting our candles, please be sure to hold the lighter to the base of the wick. We STRONGLY suggest holding the lighter to the wick for 20-30 seconds to get a good first light. NEVER burn our candles for more than 4 hours at a time. This will cause the soy to burn extremely fast. 2-4 hour increments will have your candle lasting from 45-55 hours! Benjamin Soap Company was established in 2014 with the sole mission of making pure, additive free bath, body and home products affordable for everyone. We strive to use the purest ingredients and source locally when we can. “Our process is focused on appreciating the simplicity and beauty in nature. each product from our cold process soaps to our hand poured soy candles is handcrafted in small batches. we use plant based oils, 100% pure soy wax, which is sourced from American grown soybeans, wild crafted and homegrown organic herbs.